- An icon has been added in each drive slot to load the next disk/side of a software. - When writing ATX files to a real floppy disk with a Happy 1050, you can use PDB files. Note that Chip mode and Happy mode are now excusive. Selecting Happy mode disables Chip mode and the other way. I've been experimenting with 4.3 off-and-on for a couple of weeks, and thus far, I've had no trouble with loading ATX images. Most of these are older titles. I'm now ready to make some new images from real disks using Happy, but I'm having trouble with it. At this point, I keep getting a "High Speed Transfer Error" from Happy when trying to use the Happy Backup program, booting from the 7.1 ATR disk image in D1:. When I run the Happy diagnostics without RespeQt, it passes the high speed transfer every time. My real Happy is set to D2:. Presumably, I need to use the Happy backup to copy a protected disk from D2: to a new image mounted on RespeQt. Perhaps I'm missing something in the setup. 9. Drives start to program, but every time says "High Speed Transfer Error"
Hi Larry and thank you for testing the software and giving some feebacks. Your issue is at step 5. When you select HBP, Happy software displays that it will use Happy drives D1: as source and D2: as destination. And there is no chance to modify these settings after selecting this menu. At step 7, you set the drive D1: in Unhappy mode. But this is too late ! Happy software wants D1: as the source and D2: as the destination. At step 9, Happy software is sending commands to D1: because it assumes that D1: is still a Happy drive. And of course, it fails. So, now, how can you make a backup from your physical drive to your RespeQt image ? 1. Turn your real Happy drive OFF. 7. Select option 4 in the main menu (Happy Backup). 10. Turn your real Happy drive on. The key is to substitute the image with the real drive when the pre-defined Backup option question is displayed. To be honest with you, I did not make so much tests this way (real floppy to image). 95% of the tests I performed were from an ATX image to a real floppy. Happy software always selects the lowest Happy drive number as the source and the next Happy drive number as the destination. Happy is really a great enhancements but the fact that you can not change the source and destination drive is a real pain. This is the only copier I know on Atari (and probably on many platforms) where you can not choose source and destination. Just because of this, I would remove one star if we were on a marketplace or if it was a smatphone app !!! There is an option to change the drive number of a Happy drive (option 1 in the main menu) but this is not an easy way. Thanks! That works great! I tried several "drive swaps" previously, but I did not try leaving the drive off until your post. I haven't tried the Super Archiver yet, but presume it will be a similar procedure. 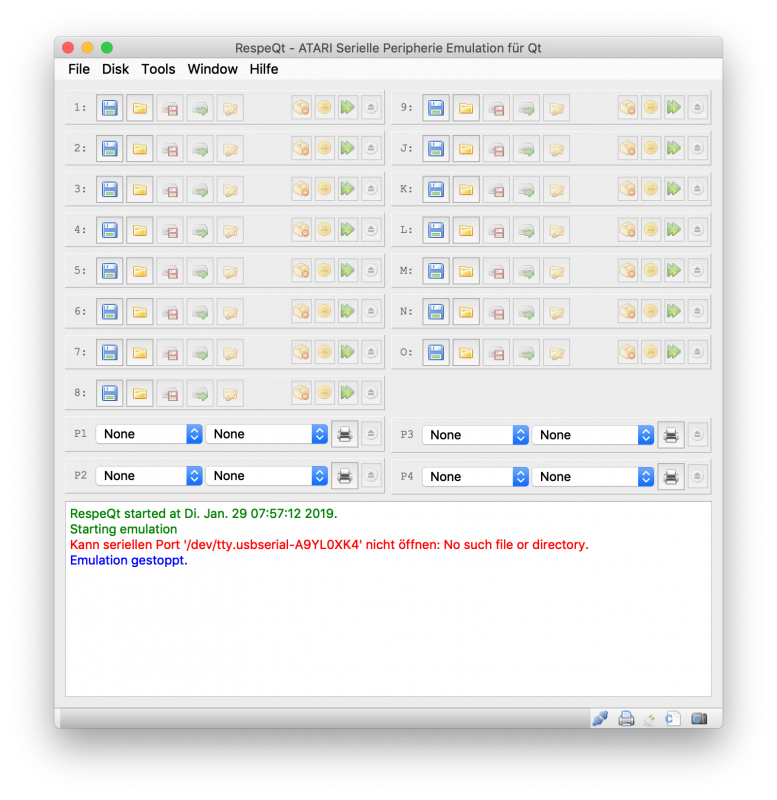 This is really great for making archival copies, and much simpler than Kryoflux. I have one, but have never gotten really satisfactory results using it -- mostly just flogging it repeatedly. Probably the next best thing (IMO) is the Freezer + Happy or SA. But this is even easier and quicker than that. I've started making a serious effort to back up my original disks -- and it is not going real well. Some of my copy protected disks (maybe 20%) will no longer load properly. That's a bummer! One very interesting incident was with an original that would no longer load/run. But when it was copied with the Super Archiver, the copy will load and run. Isn't that interesting! All-in-all, it reminds me of just how much fun copy protected software is. But I certainly understand the necessity. RespeQt 4.3 is doing a great job on most of the disks I've tried. But even with writing to images, this is going to be a really slow project. Are these changes in your github repository? I would like to build it on Linux. I've had the same issue on OS X, Linux and Win10 … I think the Qt code that the project is based around (and AspeQt as well) is just not that great, to be honest. Here is another issue I'm having, and this one may be more serious. I keep getting 139 errors while writing to an unprotected ATR with 4.3. I've got a good real FTDI chip, and I'm writing at 1X SIO. I'm also getting an occasional Data Frame Error notice from 4.3. This happens rarely, but it is happening repetitively. Any suggestions? Edit: I figured this out. For some "unprotected" disks, I need to use a Dos copy and for others I need to sector copy. Some of the tracks are not formatted, while data disks appear not to have a good VTOC. If you can build it under Linux, that's a good news. I will update the repository this week-end and post another message when done. I did build your develop branch on Linux and had to replace calls to stricmp to qstricmp in Rom.cpp. stricmp seems to be windows only, qstricmp is the QT cross-platform version. I pushed the 4.3 code into the develop branch. Oops, I forgot to change the stricmp calls (will do it next time). Would you be OK to post the Linux version in this thread to get all 4.3 binaries in the same thread ? Question... When I am copying to Happy ATX images, after one copy is completed, if I mount a new blank ATX destination image (no rebooting), then as soon as the real Happy has completed reading the first portion of the new disk, then I get a Write Error immediately when the Happy Backup starts to write to the newly mounted ATX image. If I were using two real Happy drives, then the copying would proceed without error. I imagine that this is to be expected, but curious why it produces a write error. I guess that the slot reverts to unHappy mode. The way RespeQt (or AspeQt) is running is that each time you change the content of the slot (load image or new image), the slot is reset (and also the Happy mode flag). I changed that behaviour when you "load an image" but not when you ask for a "new image". Minor cosmetic issue, but could the drive slot icons be absolutely positioned horizontally or a mono-spaced font used for the drive IDs? Every slot beyond '9' becomes misaligned owing to the alpha IDs (J through O) being proportional. Slots 1-9 are immune to the issue since number glyphs are commonly all the same width. You have eagle eyes ! I did not notice that width issue, probably because I have D9-DO always hidden. I am not a QT expert but I will try to change that in the next version. This has bothered me ever since they were added; but I neglected to make an issue of it because I never use them (just flipped the option for showing them, and wala... problem gone). Edited by MrFish, Tue Jan 22, 2019 2:21 PM. Looking forward to this. I generally compile RespeQt on the RPi units I use for peripheral emulation. It will be interesting if my current RPiZeroW can handle ATX file loading - I mean, it obviously works and works well with an Arduino Uno and an SDrive-MAX, so there's no reason about pure data throughput and timing, but the Arduino isnt' running a full OS and mouse-driven UI at the same time either. As I'm in the process of merging my code with ebiguy's fork, I can look into it. If I can solve the issue (probably), it will be in my pull request for ebiguy. How about that? Any suggestions for the font family? I added many logs in the log window and some of them can be long sentences. I don't like having a bold font for logs. That's my opinion of course. Same thing for the menu. And I guess that you use also the same font for the filename in the drive slots (even if your screenshot does not show a filename). Some filenames are very long and using a bold font will crop more letters. Is it possible to keep the same previous font but use your new one just for the drive letter ? The only font, I changed was the drive letter label font (Courier New). The rest are just OS defaults as was the drive letter font. Photo in post 20 looks fine to me, and if nothing is bold (but looks bold to some), then I can't see any point in having an option to further embolden the console window. Problem is that's the default OSX system font. Nothing in the UI settings says, that it should be bold. It just looks bold. I try to setup QT on a windows machine and recompile it with the same code and show it.